We finally got to watch this video. It was good to see so many of the people that I’ve been reading about. They are all expressing the need to address this crisis in terms of actual food shortages. 40% of our food comes from wild pollinators of which honeybees play a major role. This was presented in a positive way showing biodynamic beekeepers keeping bees for the sake of the bees NOT for the sake of the beekeeper. There were different kinds of hives to look at. I was really impressed by Michael Theile’s hives at Melissa’s Gardens. 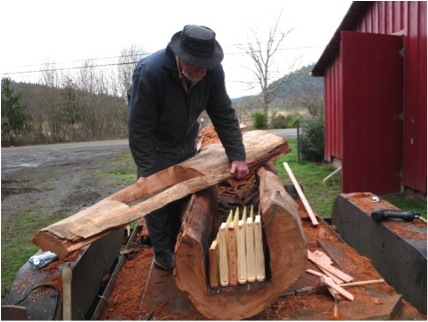 I also got to see David Heaf ride his bicycle hauling his Warre hive lift to the bee yard. This is dear to my heart because I believe we all should use less energy. My wife and I try to have car-less days. Every year we try to ‘out do’ the year before. Last year we set our goal to be a half year of car-less days and through the use of bicycle and trailer achieved that goal. I think all of us need to think how we can individually contribute to easing our footprint on the planet. I’ve often wondered how queen rearing fits into natural beekeeping. This video discusses both sides. This is a MUST SEE for everyone who is concerned about their food supply. After seeing Hal’s log hive I decided I wanted to try one. Since a tree is about the most natural setting for a bee hive it should stand to reason that the bees would do best there. I liked Hal’s philosophy of not medicating the bees, not taking their honey, and letting them swarm as nature dictates. I asked around if anyone could come up with a cedar log preferably hollow that I could use for a bee hive. Turns out that a volunteer at the blood drive was a firewood cutter “Wood Man Russ”. 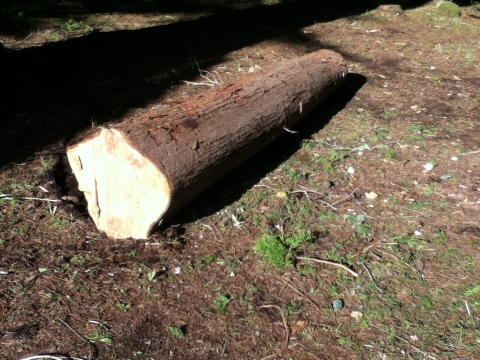 Russ Gunther supplied me with a good sized log for the project. 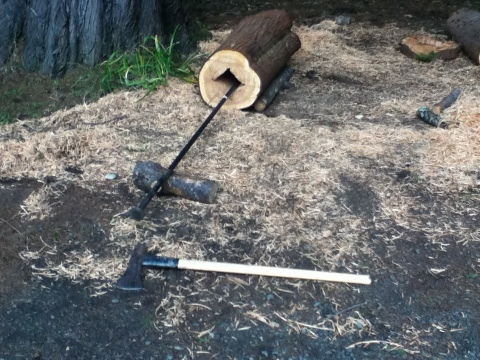 The log was good alright…good and solid, which meant I would have to hollow it out somehow. I looked for log hives on You-Tube and found Gaiabees. 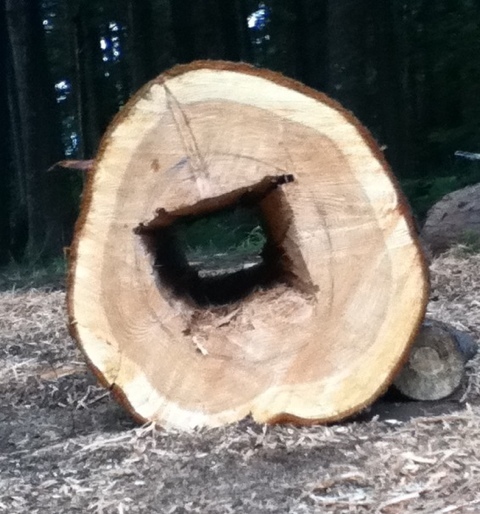 This was a beautiful log hive in a horizontal orientation. 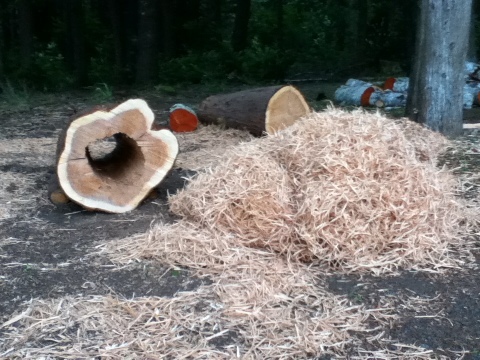 I found out how to start the process…cut the length to double the chainsaw length. That made sense. My electric chainsaw was 18″. So I made it 36″ long. I even used canola oil for the chainsaw lubricant to avoid hydrocarbons. was stated strongly in the chainsaw manual, but how else was I to accomplish the hollowing out process. I carefully disobeyed the manual…4 times on each end. Making a square from both ends and soon realized the inside wasn’t going to just push out. 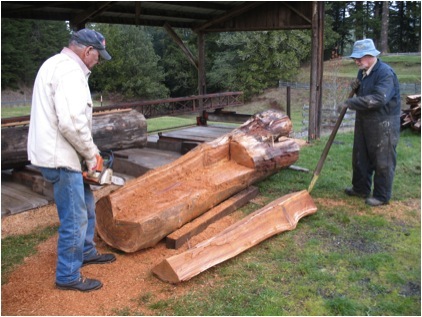 First, the chainsaw wasn’t a true 18″, but only 16.5″ of effective cutting length That meant there was at least a 3″ wall in the middle beyond the length of each end. I had to bring the sledge and bar routine into play. After much heart pounding work I saw daylight. Then I just had to saw clean out the shavings from time to time working the saw from one side to the other and rolling the log around. See also Randy and Loni save the day. Hal and Patti Strain are members of the local Beekeeping club. I met them about a year ago and have been inspired by what they are doing. They graciously gave me permission to post the following story written by Patti Strain in January of this year. In the early 1990s Hal Strain, my husband of almost 58 years, became interested in Bees. 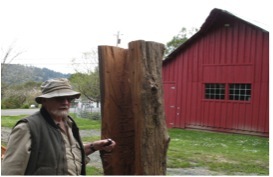 Interest grew to captivation after a beekeeping friend, Gordon Starr, placed two bee hives at our former home on Crest Acres Road, east of Coquille. 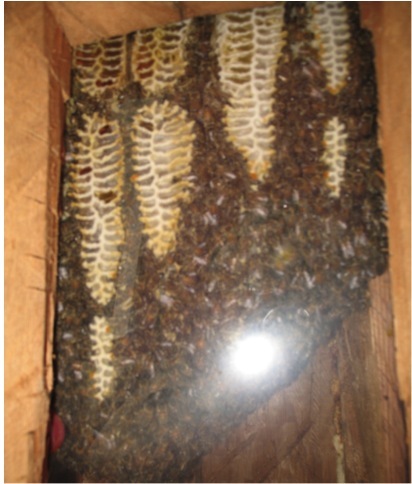 A standard hive body consists of one or two boxes, called deeps (each 9” deep). These are reserved for bees to brood and store honey for their own use. Each hive had a colony of Bees, 10 frames of beeswax foundation on which bees build six sided cells of honeycomb. There was enough honey for the bees until nectar flow began, about the end of June. Drones are larger than worker bees, but smaller than the Queen. They have one function. On certain spring days they fly up in the air to mate with a Queen. When fall arrives the hive of bees, all female, kick the drones out to die. Survival of the fittest, I guess. It is estimated the mated Queen can lay about 2,500 eggs per day and lives about five years. However it is common for beekeepers to re-queen a hive every two or three years. Or, young bees can replace a Queen that fails to lay and replenish the hive by making a new Queen. They simply feed any female larvae Royal Jelly which is “an extremely rich mixture of food.” The female larvae they choose has to be less than 48 hours old. When summer arrives beekeepers must increase space in the hive so bees can bring in honey. The basic two deeps are extended upward by adding boxes. These “supers” have 10 frames of beeswax foundation. The boxes are near 4”, 6” or 9”, most keepers use the mid-size because of weight. When frames of foundation are added and bees add six-sided cells of wax and fill the super with honey they weigh 50 to 90 pounds. The boxes are added one at a time to the top of the two main boxes when nectar flow begins. Some beekeepers increase hive height as high as they can reach, one beekeeper had his hive fall over, maybe it was too high or maybe a skunk pushed too hard. Skunks enjoy getting into bee hives. For our two hives, Gordon arrived twice a week to take away two honey filled supers, each weighing about 60 pounds. Adding two empty supers, he kept the hives low by having no more than five supers on the base. 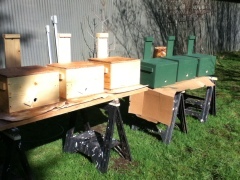 He always placed one empty super on top of the base boxes, called bottom supering, the other four higher supers were partially filled or uncapped honey left for the bees to finish their work. Good beekeeping, proved by hundreds of pounds of honey gained. Empty supers placed each week made the bees realize there was work to be done. If the hive is full, bees believe their needs are met and they will quit working. An empty super prods Bees to bring in honey while capping the supers above. However, the nectar flow must be available. That honey was so fine and clear that Gordon won first prize at the Coos County Fair in 1995, a year that had great nectar flow. The average Bee keeper usually harvests only 40 pounds of honey per hive in an average year. Gordon’s several hives in 1995 averaged 201 pounds per hive. Consistency in placing supers is important. Heavy nectar flow usually begins at the end of June and continues about four weeks. Personally, after 15 years of paying attention to bee gathering habits, we think the much abused Himalaya Blackberry provides the clearest and most consistent nectar flow in Coquille Valley. When Gordon produced that record, he explained to Hal that bees “dance” to show Workers the direction and miles to the most viable blossoms. He also said bee scouts “dance” to show which nature-made Bee home would be best if the hive swarms. With all that interesting information, Hal was hooked. He joined the Coos County Bee Association which meets 6:30 p.m. the 3rd Saturday of each month at the OSU building in Myrtle Point. He read articles and began to watch and study the habits of honey bees. He found bees exciting in their orderly way of banding together to divide labor for the good of the hive. In a short time he bought a bee suit. Gordon came down with ‘beekeeper back’, the side effect of lifting heavy supers of honey off the hive, so Hal bought his hives and equipment. Long-time members of the bee club teach new members to catch bee swarms and Hal learned and began to fill his hives. He purchased new hives too, which run about $300 complete. When he began this business a Bee swarm cost about $30, today they are about $90. It is valuable to become proficient in catching feral bee swarms. Bee club members have devised many types of poles, buckets, and covers to catch swarms that usually hand in bushes and trees. Members are so willing to share their knowledge. 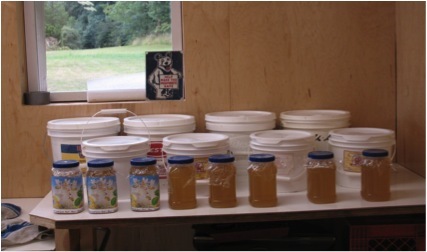 Hal developed ten or twelve hives around the county, locations provided mostly by our children who own small acreages; one on Coos River, one at Broadbent and one on Fairview Road. L G and Christy Sanders loaned a good location above Gravel Ford and Lou Grace Heyman a location at Cherry Creek. We owned two acres on the Middle Fork near Bridge and a home on Spruce Street in Myrtle Point. Each location had one or two hives, not wanting too many bees in one location. As Hal began this project we were ecstatic when he harvested 200 pounds of honey from six hives. He left each hive one super of honey in addition to what they had stored in their living quarters, making sure the bees had enough food through the winter. That harvest put us a little under the average Bee keeper who harvests about forty pounds of honey per hive, but we were pleased. Hal always says “I’m a lazy beekeeper” so he didn’t even think of trying to break Gordon’s record of over 600 pounds of honey from those first two hives. Most enjoyable of Hal’s bee operation is teaching parents, kids, grandkids and friends about bees. That made us really think of bee health and where our food supply would be without bees. At that time no one was concerned of the importance of caring for and protecting bees. We learned the small things first. Bees sting anything moving close to the hive that is black, thinking of bears who rob bee hives. Our black Lab, Zeke, stays well away from hives. Bees use warm days in winter to leave their comfy center and fly out and take a poop. Bees like warmth, keeping the brood cluster in the hive body around 90 degrees. In summer they can cool the hive by fanning their wings. Coquille Valley blossoms are awesome, but bees may starve in the lower valley when imported to pollinate Cranberries. Sometimes a hive of bees will swarm in spring, an impressive sight when thousands fly away, you hear the loud buzzzzzz first. Swarming is a worry because that valuable hive is gone. Hal often said “If they’d just leave me a note of what they need!” It may be that a new vigorous Queen wants to start her own hive? We had four or five good years harvesting honey. Then at monthly meetings of the Coos County Bee Association, members began to complain about finding hives empty. Bees were there one day and gone the next. Hal had added hives over the years. Each week he made the rounds checking bees and if necessary provide medications for mites. Yellow jackets can be a problem, and so are Bears, they love honey and leave a mess. Beginning about 2006 unknown changes in the bee’s world came to light. Actually it started earlier. Gordon said in 2005 “my bees are disoriented, not able to find their hive unless it is in line of sight.” He thought it may be due to some particularly violent sun spot activity. But, it didn’t register with any beekeeper as a long-term problem. 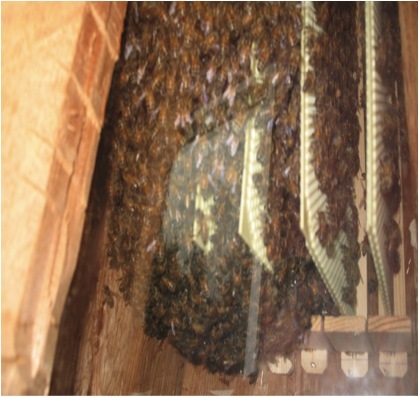 A year later the hive at our Spruce Street home, shown below, was completely empty of bees. Checked regularly, it had been full of active bees bringing in honey. 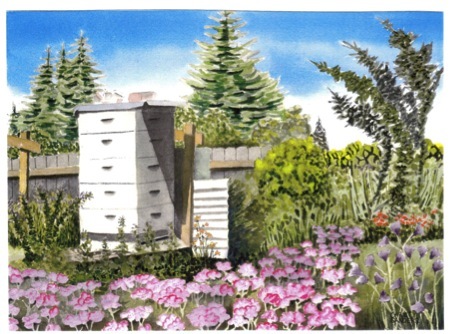 Our garden for bees caught the eyes of artist Christy Sanders. Her watercolor titled “Hal’s Hive” won a blue ribbon at the Coos County Fair and she gave us the original which we cherish. As more reports surfaced of dead bees in hive bodies and disappearing bees, Bee Club members actively discussed and dissected their beekeeping practices, trying to ferret out clues to the serious problem. During one discussion a member reported someone seeing many dead bees on Bandon beach, small bodies flung across the sand had the appearance of all dying at the same time. If true, what could make that happen? A group of club members contacted Oregon State University. The U of O hired a person and directed him to monitor bee disappearances, deaths and provide research to discover the cause of CCD, Colony Collapse Disorder. Research has been done, papers written, possibilities examined, but speculation is the only certain result. Some believe pesticides and herbicides are the culprits. Some believe wireless systems disorient bees. Some believe fluoride, “… a widely used pesticide” is responsible. France, Germany and the Italian Agriculture Ministry suspended the use of a class of pesticides known as nicotine-based neonicotinoids, as a “precautionary measure.” A film “Nicotine Bees” was delivered to the US Congress explaining the pesticide’s connection to CCD. That substance may be lethal to Bees, but the United States has yet to act. If Congress did act to ban certain suspect pesticides and herbicides, a serious food shortage may develop. Without certain chemicals Agribusiness in the US and elsewhere may not be able to grow enough food to feed seven billion people. Since we have a large garden to grow some of what we eat, I know it is mighty hard to be food self-sufficient. After a year or so ruminating on bee deaths, Hal came from the barn one day and said “I’m going to build a Bee Tree. Maybe a purely natural hive that is never disturbed or medicated or robbed can survive in a man-made but natural log cavity. Maybe such a hive will send out swarms that will help restore bee populations. Even if they die for some reason we don’t understand, it is better to do something than nothing” So he began to talk at the Bee Club about what he was going to do. Once a project is stated to others, you have to carry through. 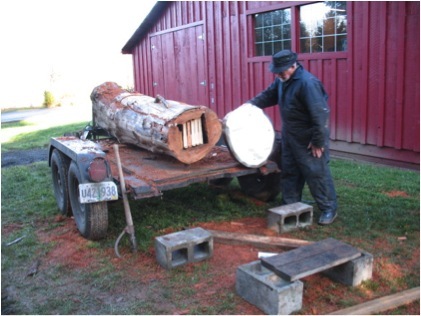 A beekeeping friend, Randy Sturgill, had a cedar log at his house and gave it to Hal. The fat was in the fire so to speak. Randy then offered to use his 4 foot chain saw bar to hollow the center out of the tree. 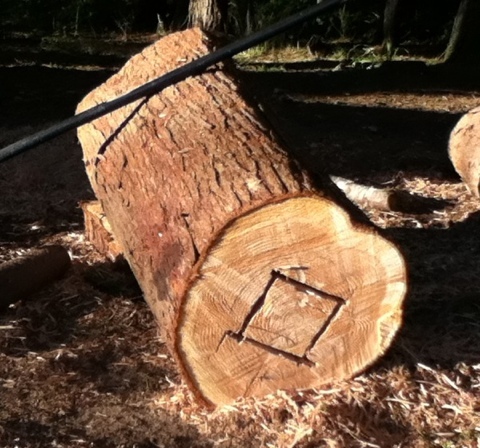 The men soon found that was tough work and thought it better to first split the log along the grain. 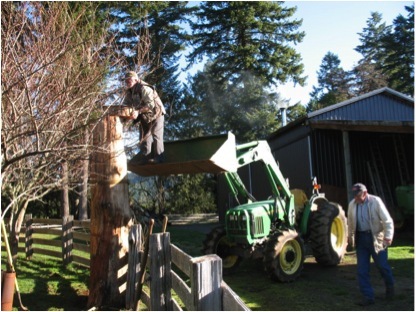 Randy delivered the log to our place and Hal went to work. The picture at top of page one shows the log after being split in two sections. Put this word in your search engine and you find where I got this information. Can we believe it? 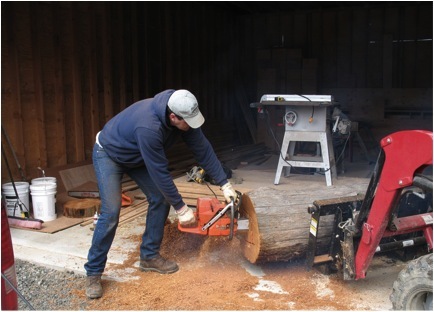 Splitting the log and hollowing it out, Hal placed a small plastic window on the small slab and attached a small door with a handle. He then placed five frames of beeswax foundation inside the log, plus a frame full of honey. He connected the log together so it looked like it had never been apart. He put to “lid” in place and “planted” the bee tree on the south side of our barn where it is out of the wind and the entrance hole is hit by the first ray of morning sun. The final touch. 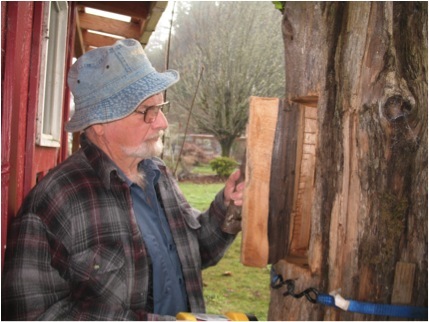 Hal inserted an old wood spigot found at Lazy Dog Antiques and hung a “transfer bucket” to drain honey. Kids, after looking at the bees and honeycomb in the hive window, think if the spigot is opened honey will flow out into the “transfer bucket.” A few adults have even questioned that possibility. Within a few weeks bees were hovering, were they robber bees or bees looking for a new home? Returning one morning from his walk, Hal found a good-size swarm of Bees had moved in through the one inch entrance hole placed in the center of a knot hole. How many bees? He couldn’t tell, but we opened the door and took a picture. Regular picture taking through the window, open for only seconds, documents the growth of the hive. These bees have been inside the hollow log, now a standing bee tree, for almost a year. A thriving Queen will lay eggs the size of a grain of rice, a new generation of Bees will hatch in 21 days. On a warm spring day bee scouts will survey the immediate area. They will perform a “dance” at the hive to inform worker bees the direction to fly to find the best and most prolific stand of blossoms with pollen. Our lives are intricately tied to bee health and their industry. Bee losses some years have ranged up to 20 to 30% loss of all hives in the United States. That is very serious. This picture, three months later, has fresh comb full of honey. No longer can you see the foundations Hal put in. He is confident this bee colony in #1 Bee Tree is going to thrive, that is if CCD doesn’t take their lives. Trying to save and protect bees is a good thing. 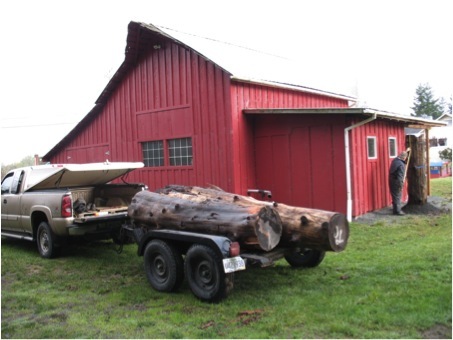 Three weeks ago Hal bought two cedar logs from Sproul’s East Fork Mill at Norway. Bee Tree #2 has been split, hollowed out with the help friend, L G Sanders, window and door made and installed and the log made whole again. #2 is standing in L G’s and Christy’s plum orchard above Gravel Ford. Hal has #3 Bee Tree ready to place next to the green house he built two years ago. 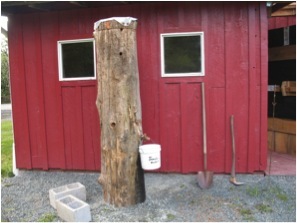 Pictures of steps taken to build #2 Bee Tree are shown below. A video of a swarm flying INTO Hal’s log hive.